Well, I got those pesky taxes done and out of the way with time to spare! (Let’s see, about a hundred hours to spare, I figure.) So I sort of, almost, kept my New Year’s resolution to not fall behind and do my taxes at the last minute this year. We wound up owing a bit, so it’s not like we lost out on getting an early refund. Astronomically speaking, I just read a couple of interesting stories. Venus, that greenhouse hothouse of a planet, has a new visitor—the European Space Agency’s probe Venus Express, which entered orbit around the planet just yesterday. Here’s to Venus Express [takes a swig of Winterhook Ale]. Out at the other extreme of the solar system, Hubble scientists have taken a look at Xena, aka 2003 UB313, considered by some to be (maybe) the long-sought 10th planet. The Hubble people put its diameter at 1490 miles, rather than the original estimate of 1860 miles. That would make it almost exactly the same size as Pluto. Says Space.com: “Since 2003 UB313 is 10 billion miles away not even as wide as the United States, it showed up as just 1.5 pixels in Hubble’s view. But that’s enough to precisely make a size measurement, astronomers said.” If they can really do that, that’s…impressive. And finally, consider RS Ophiuchi. It’s a binary star system, a white dwarf and a red giant. Like many such pairs, it’s also a source of fireworks, as matter falling from the giant onto the white dwarf periodically causes the smaller star to explode. What’s different about this star is that it blows up inside the atmosphere of its larger buddy. This is something new, never seen before. No, not the WWF, or anything remotely resembling it. It’s the U.S. Girls’ Wrestling Association, an organization that promotes folk-style (high-school style) wrestling for girls, just as much larger associations promote wrestling for guys. They have many tournaments for girls after the regular wrestling season is over, and girls who have been training in a mostly male-dominated sport all winter can come together and wrestle each other. My older daughter Lexi and I are heading to Ohio later today so that she can compete in one such tournament. We’re also going to squeeze in a visit to a college, as we’re just about to start ramping up what I’m sure is going to prove a long search. Here’s a picture of the two of us, taken recently at one of the Massachusetts sectional tournaments—by the mother of one of the guys she came up against. Photo © 2006 by Denise Brown. Reproduced here by permission. It was a great group of people, and I continue to be impressed at the way wrestling is developing as a sport for girls. 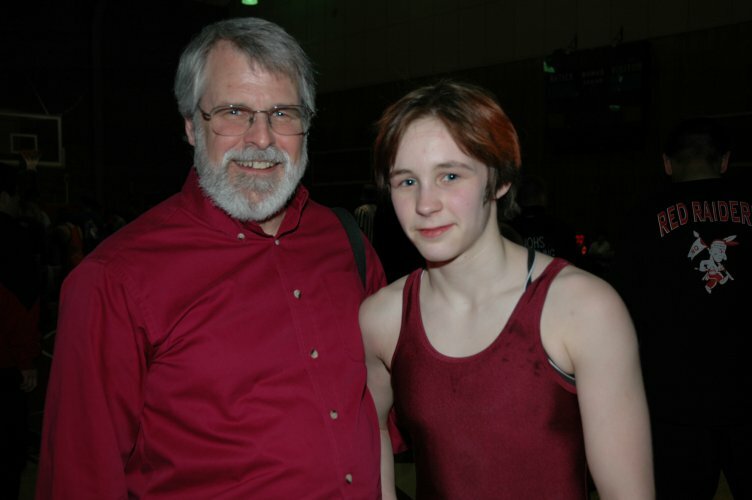 This tournament was directed, by the way, by one Lisa Nowak, a young woman who paved the way for girls’ wrestling in Maine by taking her case for her right to participate in the sport to the Maine Human Rights Commission. She now is a wrestling coach at the Hyde School, coaching both boys and girls—and was a delightful person to meet. There have been some interesting comments posted to my entry below on faith and rationality. If you don’t ordinarily look at the comments, I recommend you scroll down and take a look at those. Maybe you’ll have something to say in response. Please feel free. Meanwhile, I’ve just come off editing a year-end video piece for the school wrestling team (a sort of wrestling music video)—which was a lot of fun to do, but involved some late-night video-editing sessions. Now, I’m back to organizing a year’s worth of receipts to do my taxes (let’s hear it for Turbotax), and still cranking away on the miniseries novelization. That’s fun, too. Oh, and I’m about to start a new round of consulting editing (I edit and do rewrite on educational web content, for teacher professional development—if you should happen to sign up for a PBS Teacherline course in high school algebra, there’s a good chance you’ll be coming across material that I worked on). So…that’s why not enough sleep. That’s also why not enough entries in the blog. But I’m trying. I’m glad you asked. The answer is, more than you might think. I wrestled all four years when I was in high school in Huron, Ohio, and during my first year of undergraduate school, at Brown University. During that time, I learned that wrestling requires enormous dedication, self-discipline, and conditioning. Also, that stepping out onto the mat as a young adult, to face an opponent one-on-one, calls on all your reserves of courage and poise. And that in the long run, the experience goes a long way toward developing self-confidence. (I was a pretty shy kid, really—kind of geeky, afraid of girls, and not terribly good at sports in general. This sport represented a major area of growth for me.) Coached properly, wrestling also develops a sense of good sportsmanship, respect for the opponent, and the ability to win and lose with equal grace. Here’s a short SF story I wrote about wrestling, originally published in the anthology Warriors of Blood and Dream, edited by Roger Zelazny. It’s called Shapeshifter Finals. *It pains me to acknowledge it, but a well-known thug who is also our current Secretary of Defense was also a wrestler and coach. Oh well, no sport’s perfect. Second Place at All-Girls Wrestling Tourney! Got home late last night from a weekend in New Jersey, attending our first all-girls wrestling tournament, the USGWA New Jersey Girls Wrestling State Championships Open. Lexi placed second in her weight grouping, winning three matches (one with a pin and one in double overtime) and losing one. More importantly, she had a great time, and made some new wrestling friends from other states. One of the organizers commented on his past experience with girls’ tournaments, noting that the girls are much more likely than the boys to get together after competing and hug and make friends with each other. Most of the girls we talked to were in the same position as Lexi–participating on boys’ wrestling teams, often as the only girl, and attending events like this after the season. A recent USA Today article on girls’ wrestling noted that the number of high school girls wrestling nationwide is currently about 4000, up from about 100 in 1990. If you’re interested in all-girls wrestling, here’s the go-to group: the US Girls Wrestling Association, or USGWA. And here are some pix from the tourney. Here it is, from days long ago, at a university not so far away.